There is something about comfort food... especially on a rainy day! 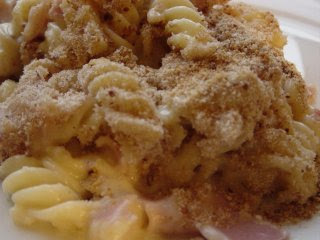 So, for all you comfort food lovers, I decided to take a photo of the yummy, comforting and most favourite dinner we had for tea last night... macaroni cheese with ham and breadcrumbs on top (my version anyway). So quick and easy to make... and most of the family enjoyed it! I always like the smell of Macaroni cheese .... but am not a fan of eating it. I'm weird! thanks for the kind comment! your blog is great as well & what a cute little family you have. that mac & cheese looks delicious as well! When Jackie's away at work its always an opportunity to cook up a yummy Mac'n' Cheese (with extra cheese)for me and the kids. Love the breadcrumbs - nice touch. Ha ha Les - I heard about Jackie's dislike for plain ol boring mac'n cheese... must be the indian in her!